The 66-page book is a simple explanation of basic Christian belief and it’s relevance to life today. The chapters are short, with related Scriptures listed at the end of each. It uses the basic gospel script of the sharing the Law and then the Gospel. It covers other basic points such as the authority of Scripture, sovereignty of God, the person and work of the Holy Spirit, prayer, and so forth. His goal within each chapter seems to want to build a case that the best spiritual life is one centered in a relationship with Christ. In Chapter 9, he offers a roadmap on how to begin your spiritual life by inviting Christ into your heart. Yielding to the work of the Holy Spirit in your life, available only to those who have received Christ as Savior and Lord, will change your life today, not just for eternity. The book can be used as a primer or a review in your basic discipleship work. It assumes the reader has a biblical worldview and agrees with the authoritativeness of Scripture. As a tool to use in personal evangelism, the biggest challenge will be the book’s generous use of Scripture. The assumption of biblical authority runs through the text. If the seeker reading the book doesn’t yet share that foundation of biblical authority, the proofs offered in the book may seem circular or insufficient. To use Beyond Belief as a pre-Christian evangelism tool in small groups, the small group leader should be aware of how to handle alternative worldviews and help the seekers discover biblical authority. I appreciated the simplicity of how he treats the exclusivity of the gospel, and how he affirms that Jesus is the only way to salvation. I share that belief so I had no problem with it’s presentation. For my readers who don’t share that viewpoint, this book may seem too fundamentalist to your liking. The book is simple, short, and can likely be read in one sitting. As a small group resource, I can see where it can be useful for those who grew up in a church and left and are reaching a season in their life where they are returning to their Christian roots, where there are still seeds of respect for Biblical authority. 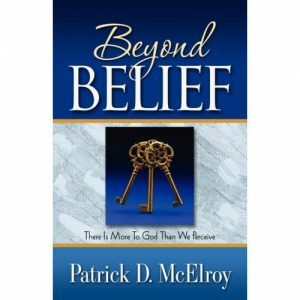 Order your copy of Beyond Belief direct from Amazon. Buy through the link and we’ll receive a few pennies commission to support our work.